Enjoy breakfast or lunch at a great place to meet, in the California sunshine of downtown San Clemente. A hidden gem among the dining establishments in the seaside village of San Clemente, our restaurant occupies the Spanish-style courtyard of the former San Clemente Hotel, an original, historic Ole Hanson building. 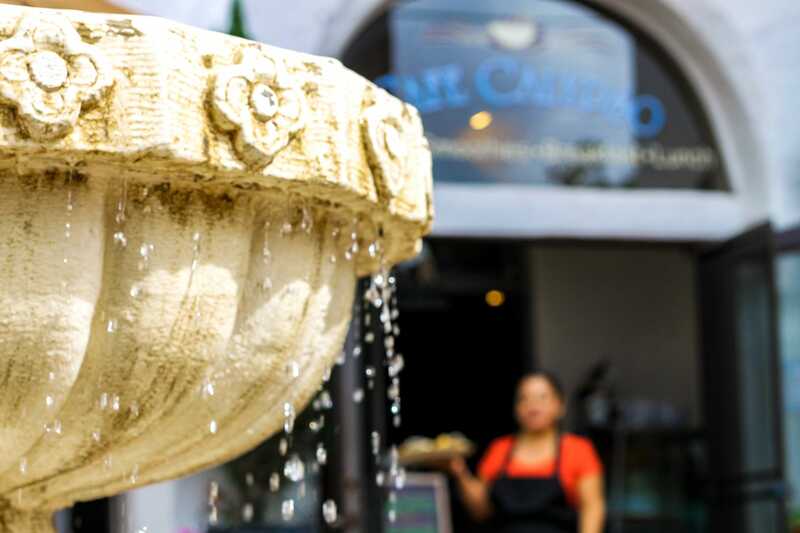 Located amid the quaint shops and service establishments on Avenida del Mar, Café Calypso offers intimate indoor seating and a sunny outdoor courtyard/patio with fountain. On special weekends, you’ll enjoy local entertainers playing live music in the courtyard. The Cafe Calypso breakfast and lunch menu specializes in fresh, healthful salads, soups, breakfast- and lunch-style wraps and sandwiches, and a variety of delicious pastries. Libations include a variety of hot and cold coffees and teas, fruit drinks and smoothies, and beer and wine. A central gathering spot where everyone seems to know everyone else, the Downtown San Clemente Cafe has become the informal meeting place for local shop-keepers and town officials seeking a brief outdoor escape. With full-service catering, Café Calypso is a great place for more formal business and social events and personal occasions of all types. Our menu is also available for catering offsite events and parties. A Journey from Southeast Asia. The amazing story of how Chen Yen and her younger sister Pan came to be owners/operators and your hosts at the Café Calypso restaurant reflects a stark and poignant chapter of recent history. Born in Cambodia, at the ages of 8 and 6 Chen and Pan escaped with their parents and other family members from the slave labor camps of the Khmer Rouge, to which they had been “relocated” from their grandmother’s plantation during the communist revolution of 1975. Traveling at night through the “killing fields” -- avoiding snakes, tigers, land mines and Pol Pot’s murderous troops – after many days the family finally reached Thailand and what they believed was to be their dream of freedom. However, on entering Thailand the family was again “relocated,” this time to a refugee camp in the mountains of Cambodia. On their first night in the new camp a mass escape took place, in the midst of which Chen and a sister-in-law became separated from Pan and the rest of the family. Happily, both family groups were able to make their separate ways through the mountain forest. And by some miracle, as dawn broke, in the massive human congestion and confusion caused by a roadblock at the Thai border, the Yen family was reunited. There they were finally allowed to cross into Thailand. After a nine-month stay at a refugee camp, the family received an American sponsor and finally came “home” to Orange County, California, arriving at John Wayne Airport in November of 1976. The strength and positivity that brought Chen and Pan to America stood them well through the trials of learning a new language and culture, and acquiring college degrees, culinary expertise, and citizenship. That same focus and determination brought them to establish the Café Calypso restaurant in 2002, and continues to be reflected in their genuine commitment to making your every visit to Café Calypso as enjoyable as possible.